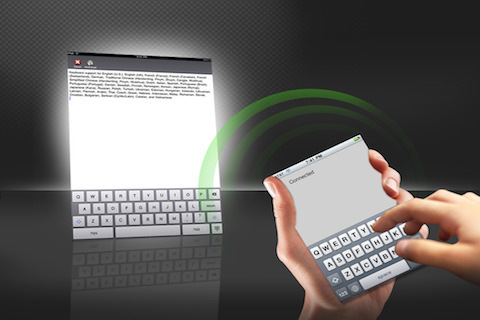 Do you know of any apps which will let me use my iPhone as an external keyboard for the iPad? Unfortunately, due to the restrictions on the iOS SDK, there is no app that will let you use your iPhone as a keyboard for your iPad systemwide. However, we think we've found the next best thing. To find out, follow along after the break! External Keyboard [$0.99 - iTunes link] is an app that will let you use your iPhone as a keyboard for your iPad via bluetooth or WiFi, but there's a catch - you must have the app opened on both devices at the same time in order to do so. This limitation is a bummer, but it works. On the iPad, External keyboard is web browser and on the iPhone, it's just a keyboard. Just tap which fields in the browser you'd like to type and start typing away on the iPhone. There is also a button for email. This opens a blank screen with an option to email what you type. If you choose to email, it pastes your text into a new email where you must use the iPad keyboard to complete. If you need to type text into a different app, you can copy it from this email section, close the app and paste into any app you wish. Clearly, this isn't the most elegant of solutions, but until Apple opens up the SDK, it's as good as it's going to get. Anyone else have any App for That suggestions for @Sethran? Let him -- and all of us -- know. Having trouble finding what you need in the app store? Send us an email to iosapps@tipb.com and let us know what you're looking for, and we'll do our best to find you just the right App for That!